HGR 025 - Shootouts & What Can We Learn From Them? This week, Ryan and special guest Steve Remy from Gun Guy Radio & FRN discuss four shooting incidents and what we can learn from them. Ryan- Enjoyed Christmas with my wife & family; got some Cabela’s gift cards so will be doing a little shopping for the 1851 Navy Colt reproduction. Hopefully I can find some 3F powder for a reasonable price! Steve- Enjoyed my Christmas week with family; received many fun gifts related to my hobbies. Received a slew of holsters from Werkz holsters and am testing and reviewing them over the next few weeks. Still in SHOT show prep mode. Main Topic - Shootouts: What Can We Learn? Our intention here is NOT to “armchair quarterback” these shootouts. We are going to look at them and discuss them in a purely analytical manner. Also, please understand that we are not trying to be casual and denigrate the tragedies that these shooting incidents were. We are trying to discuss them and see what we can take away from each of these incidents that can help us learn & be more effective whether we are a Law Enforcement Officer or an armed citizen. I also must give a great deal of credit to Massad Ayoob & his articles in American Handgunner. Ayoob has analyzed many shootings and his critical analysis and gathering of information on these shootings allows us to have all the information we need to look at them in an analytical fashion. Also note, there are several videos linked below. Two of the videos are reenactments of the shootouts and the other two are Dashcam and CCTV footage. I include the links here to assist you in understanding how these incidents played out, in case you have difficulty following our discussion. However, I will warn you that the videos are graphic at times and are very sobering. It is not easy to see these brave LEO’s fired upon by attackers. The CHP Officers were armed with 12 gauge Remington 870’s and .357 Magnum revolvers, both the Colt Python and S&W Model 19. The perpetrators were armed with a large assortment of weapons, including a S&W .38 Bodyguard, two .45 ACP 1911 Pistols, a 4” S&W Model 28 Highway Patrolman, and a sawed off 12 gauge shotgun. The ensuing shootout resulted in the deaths of all four officers, and eventually Twining, who fled and shot himself when cornered. One part of the shootout that was not discussed until fairly recently was that a passing motorist, Gary Kness, stopped when he saw the shooting. Kness was unarmed, yet he ran TOWARD the gunfire, and picked up the fallen officers’ shotgun. He racked it, and pointed it at the gunman, but when the trigger was pulled, he heard a resounding “click”. He then retrieved one of the fallen officers revolvers and fired a shot at Davis, which ricocheted off the gunmans car but still caused a chest wound on Davis. The revolver was then empty, at which point Kness fled to cover. Below is a link to a training film that was made that shows the Newhall Shootout as it happens. FBI Agents: Total of 8. 5 were wounded, two, Jerry Dove and Ben Grogan, were killed. The agents were armed with an assortment of shotguns and pistols, including S&W Model 19 revolvers, S&W Model 686 revolvers, and S&W Model 459 9mm Semi-automatic pistols as well as Ithaca Model 37 shotguns. Note that all of the revolvers carried by the FBI agents were loaded with .38 Special +P ammunition, even if they were chambered for .357 Magnum. Perpetrators: William Matix (shot six times) and Michael Platt (Shot 12 times), both armed with an assortment of weapons they had stolen after murdering recreational shooters at remote gun ranges. These weapons included a Smith & Wesson Model 3000 shotgun, a Ruger Mini-14 .223 rifle with the magazines jungle-taped together, a S&W 586 .357 Magnum and a Dan Wesson .357 Magnum revolver. This incident led to the assertion that officers handguns had to be much more powerful, and started the development of the 10mm Auto cartridge, as well as the S&W Model 1076 pistol to go with it. It was noted that the reload speed of a semi-automatic may have helped in the gunfight. Also, a couple agents had placed their firearms on the passenger seat before the traffic stop to allow quick access. In the car accident that preceded the shootout, the agents lost their weapons. One officer was then rendered unarmed, the other had a S&W Model 36 in an ankle holster as a backup gun, which he used during the gun battle. Below is a reenactment of the gunfight from a made-for-TV movie called In the Line of Fire: The 1986 FBI Miami Shootout. You may have seen this video, but a patron of a internet cafe who is present for a robbery uses his concealed carry pistol in self defense. He fires several shots at the fleeing suspects. It looks like hes using a subcompact .380 or 9mm and that place is extremely crowded. What do you think of the situation? What can we learn from this encounter? Until next week, have fun, Happy New Year and SAFE SHOOTING!!! In this eve of Christmas Eve episode, Ryan discusses the quickdraw used on the Miami Vice episode “The Hit List” and also reads over some listener e-mails! Finished up all my Christmas shopping! (Waited until the last minute as usual.) Noticed that a lot of things at the outdoor retailer/shooting stores like Cabela’s were out of stock and backordered. I would take this to be a good thing as it makes me think that a great deal of people have gotten involved in the shooting sports over the last year. Don’t discount firearms books and training books when you are using those gift cards after the holidays. A book may seem like a boring purchase compared to some ammo or reloading supplies, but it can impart a great deal of knowledge to the reader and enable them to be a better shooter. One of the greatest gifts is knowledge. Unfortunately, famed AK47 designer Mikhail Kalashnikov passed away today at the age of 94. His timeless addition to the world of small-arms will always be known as a groundbreaking rifle, both in terms of proliferation and reliability. In one of the biographies I read about him, it was said that over half of the AK-47 rifles currently in circulation are unlicensed copies and that Kalashnikov did not make any significant financial gains for designing the rifle; it is said he did it simply because he wanted to give back to his country. I am excited to see that Ruger is releasing the LCRx which is the standard Ruger LCR but with an exposed hammer. I have always liked the design of the LCR, but I really prefer to have a hammer on my revolvers. The LCRx now offers this and I will definitely try to take a look at & shoot one. This weeks main topic may be shorter than the usual but even though its just before Christmas. I still wanted to put something out so while you are laying in your recliner digesting your holiday meal, you can still get your weekly dose of handgunning talk! Even though I was not old enough to watch the show on its original run, Miami Vice is still a classic, and is more accessible than ever thanks to Netflix streaming. Miami Vice was always known for its attention to firearms (the director was Michael Mann, who was a known “gun guy” and attended Jeff Cooper’s Gunsite.) Many people remember the gun that Sonny Crockett carried during the first season, the ill-fated Bren Ten. The Bren Ten was a large, semi-automatic handgun that chambered the then brand new 10mm cartridge. While the Bren Ten didn’t last too long on the show, one scene was forever burned into our memories; the quick draw “Mozambique Drill” done by Jim Zubiena in the episode “The Hit List”. 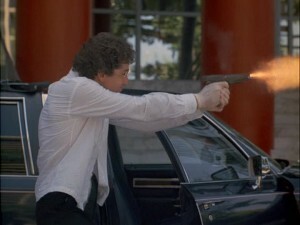 In the scene, Zubiena is a hitman posing as a limo driver. After assassinating the targets with a few well-placed shotgun blasts, the hit man is confronted by a bodyguard. Faking surrender, the hitman raises his hands up, and then quickly draws from the appendix position and fires three rounds in under two seconds. There is a video online from the people who produce PACT timers that shows the video clip and times how long it took the hitman to fire three shots. The timer came up with 1.38 seconds. In the soundtrack on the TV show, it only sounds like two shots, but if you watch the muzzle flashes it is three shots. People ask why he clears the gun and sets it on the dead man’s chest as he walks away. Jim Zubiena explained that “this was in the days before really good forensics and he cleared the gun so it couldn’t be used against him by anyone else. He also noted that once he put the gun down and started walking away, he could have been anyone; a guest or an employee etc. It separated him from the action. The video clip goes to show you how quickly a threat can attack. If you are ever staring down a threat, this video is a great example as to why that threat should have your undivided attention. The gun used in the scene is a 1911 pattern pistol, which has a manual safety. I have seen people online attempt this draw, except with a Glock. I personally would not feel comfortable doing this, as appendix carry does position the gun over some rather important arteries and vital organs. From Brendan: I really enjoyed how you explained the differences between the blowback system and the locked breech systems in auto pistols. There is one system you haven’t touched, the rotating barrel system found in the Px4 Storm. Are there some benefits in using this unique system? Why hasn’t it been implemented in other auto pistols? What are some of the drawbacks? Many older pistols, the Mexican 1911 Obregon, Steyr Hahn M1912 and others used rotating barrels. Barrel moves along one axis, doesn’t tilt. Better accuracy? Could be more sensitive to ammunition? Video on Forgotten Weapons. Pretty simple, uses spiral groove around the chamber that rides a corresponding lug that rotates the barrel to unlock it. From James: I really enjoy your show, especially how you like and discuss revolvers. Have you thought about doing a show on Cowboy Action Shooting? Basically discuss some of the Single Action revolvers that can be used, by Ruger, Cimmaron, Uberti, etc and compare their price & quality? Until next week, have fun, Merry Christmas, Happy Holidays and SAFE SHOOTING!! !